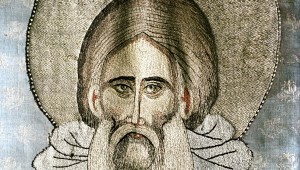 Sergius lived and died in the same unshakable humility, and humility is needed now more than ever in this poor and wretched world. Rich and worldly men extend their private empires, grinding the faces of the poor as such men have always done. 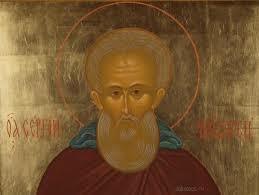 This year marks the 700th anniversary of the birth of a child born in Varnitsa, Russia, to his parents Cyril and Mary. He was their second child, and they named him Bartholomew. Doubtless they had plans for their son, hoping that he would prosper as they had prospered, and live a comfortable life. God, however, had other plans for the boy. Eventually at the age of twenty-four he would be tonsured a monk, and known to the world forever after as Sergius of Radonezh. 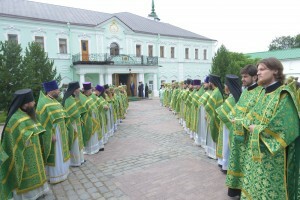 He is venerated by those in Russia as one of the great founders of Russian monasticism. But what about those of us who live outside Russia? 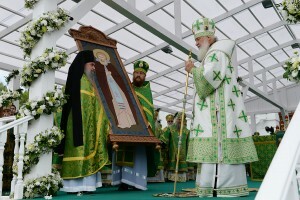 What could St. Sergius mean to us? He then had to obtain the blessing of the local bishop to become their abbot, and even here the humble saint tried to find a way out. Accompanied by two of the brethren, he went to visit the local bishop and asked him to give them an abbot, hoping no doubt that he would pick someone else. When the bishop picked him, Sergius again insisted he was unworthy. The bishop replied, “Beloved, you have acquired all the virtues except obedience.” Seeing no way out, Sergius bowed low and accepted ordination to the priesthood and the task of being their abbot. His career in monasticism had begun in earnest, and would continue to grow. There was now no looking back. Sergius lived and died in the same unshakable humility, and humility is needed now more than ever in this poor and wretched world. Rich and worldly men extend their private empires, grinding the faces of the poor as such men have always done. Nations vaunt themselves, puff themselves up, boast against their neighbours, and wage war against those weaker than themselves, and the earth shudders under them. Even in the Church some men embark on their own careers, and preen themselves, feeding themselves rather than feeding the flock (see Ezekiel 34:1-6), swelling themselves with pride. Now more than ever we need the example of humble Sergius. He was one who knew what true greatness looks like, and who believed the Lord when He said, “Whoever would be great among you must be your servant, and whoever would be first among you must be slave of all” (Mark 10:43-44). No spirituality can exist that is not built upon humility. No real life or joy can come to men unless they first become like little children. St. Sergius knew this, and lit a light in his native Russia. The whole world may be grateful for this, and strive to walk by its light.